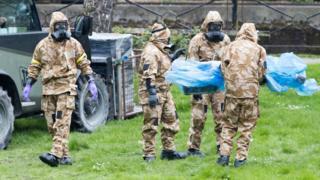 The chemical weapons watchdog has backtracked on its suggestion 100g of Novichok nerve agent was used in the Salisbury spy poisoning. The head of the Organisation for the Prohibition of Chemical Weapons (OPCW) told the New York Times that amount may have been used. The OPCW later said the amount should have read "100mg". Sergei and Yulia Skripal were found unconscious on a bench on 4 March after being exposed to the nerve agent. The UK accuses Russia of being behind the attack, but Russia strongly denies this. Speaking to the newspaper, OPCW director general Ahmet Uzumcu said that an inspection of various sites in Salisbury indicated "50, 100g or so" had been used. He added that amount was more than was needed for "research activities", which would only require "five to 10g". However, the OPCW then released a statement saying it "would not be able to estimate or determine the amount of the nerve agent" used in Salisbury. It added: "The quantity should probably be characterised in milligrams." When asked by BBC to clarify whether Mr Uzumcu had meant to say "milligrams" in his first estimate or genuinely thought 100g had been used, the OPCW merely stated that milligrams "should have been used". Mr Uzumcu also said the nerve agent was in liquid form and could have been applied with an aerosol spray or, "if you take the necessary measures, you could use it as a liquid". "One thing, perhaps, which is important to note is that the nerve agent seems to be very persistent," he added. "It's not affected by weather conditions. That explains, actually, that they were able to identify it after a considerable time lapse. We understand it was also of high purity." Mr Skripal, 66, remains in hospital but Ms Skripal, 33, was discharged on 9 April and taken to a secure location. Wiltshire Police Det Sgt Nick Bailey, who attended the scene, was also treated in hospital after being exposed to the chemical, but has since been discharged. A clean-up operation is under way in the Wiltshire city, although no time-frame has been given for its completion. The UK has blamed Moscow for the attack, expelling 23 Russian diplomats and their families. Karen Pierce, the UK's representative to the United Nations, told a meeting in April there was "no plausible alternative" to the explanation that Russia was responsible. She said: "No terrorist group or non-state actor would be able to produce this agent in the purity described by the OPCW testing and this is something Russia has acknowledged. Twenty-nine countries also expelled 145 Russian officials in solidarity with the UK - and Nato ordered 10 Russians out of its mission in Belgium. Moscow has denied any involvement and has responded by expelling British and US diplomats, as well as several from other countries. It has also closed the British Council in Russia and the British Consulate in St Petersburg.